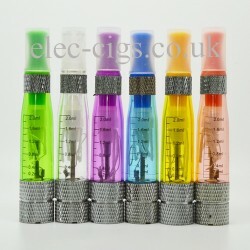 The CE5 Atomizer is the big brother of the CE4 Atomizer. 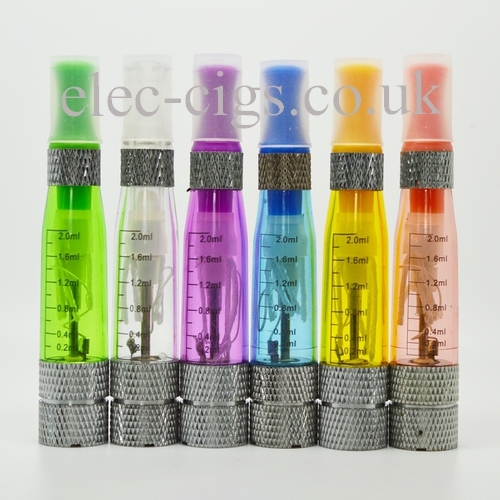 It holds 2.0 ml of Eliquid and will work with any Ego Battery; If you are unsure please drop us a line at 'sales@elec-cigs.co.uk' and we can advise you. It is a well constructed Atomizer and it is available, from stock, in the following colours: Clear, Green, Blue, Purple, Yellow, Black, Red and Peach. To fill your CE5 Atomizer with eliquid, unscrew and remove the inhaler tip, hold the tank at a 45 degree angle and pour the e-liquid in. Screw back the mouthpiece onto the Atomizer Do not fill the air hole in middle as that will prevent the vapour from passing through.